Transform the look of your existing uPVC doors, windows, or conservatory for 80% less than it would cost you to replace them, using the latest uPVC painting technology. Though uPVC doors and fixtures are often used to replace wooden fittings, which require yearly maintenance to ensure their upkeep, over time the classic white uPVC fittings can begin to look tired and worn, and though their insulative and weatherproof properties remain intact, their aesthetic wearing can make your home look untidy. And that’s where uPVC spray painting comes in helping to rejuvenate, enhance and update your uPVC doors. So, if you want to change the look of your uPVC doors at home or your business, then our team here at The Restoration Group are ready with a latest uPVC spray painting solution, allowing you to choose from a whole range of colours and providing the same level of warranty as replacing your uPVC fixtures would but at 80% of the price. Our specialist team can carry out our quick and affordable uPVC spraying on all of your external and internal uPVC doors in a single visit, with the paint solution being dry to touch in just 30 minutes. The process involves firstly cleaning your uPVC doors with a specialised detergent and solvent based solution to enable the paint to adhere to the door surface correctly, we’ll then slight abrade the uPVC door surface again giving the paint a perfect surface to adhere to, before finally masking and covering up any glass and metal work on your door, ready for the paint application. Our team will then apply a minimum of three coats, depending on the chosen you’ve selected. After the paint has dried we’ll do our final checks and then return your home to its previous state, minus your newly sprayed uPVC doors. 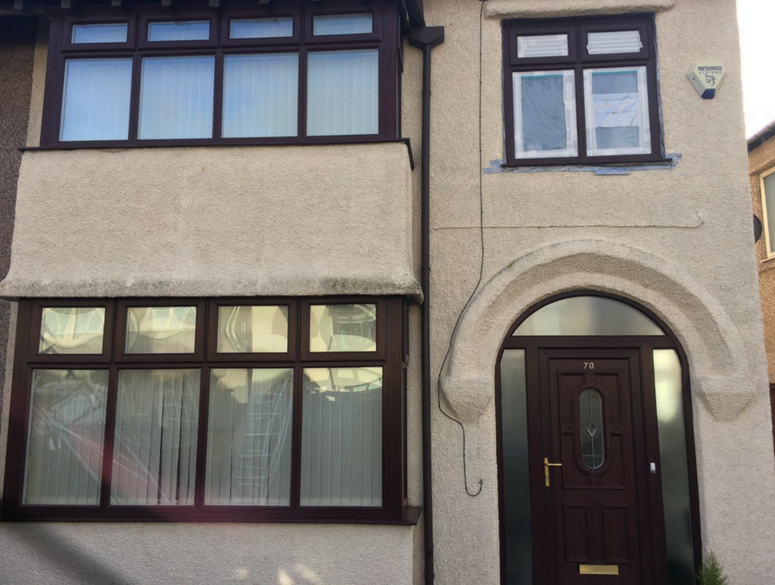 If you’d like to learn more about the benefits of our uPVC door spray painting process, then head over and check out our blog: 5 Benefits of uPVC Door Paint. Alternatively, if you’d like to receive a free quote for the uPVC spray painting of your doors, windows or conservatory, then simply complete the form on the right or give our expert team a call today on 0161 327 0482 and we’ll be happy to provide you with a full quote and answer any questions you may have. 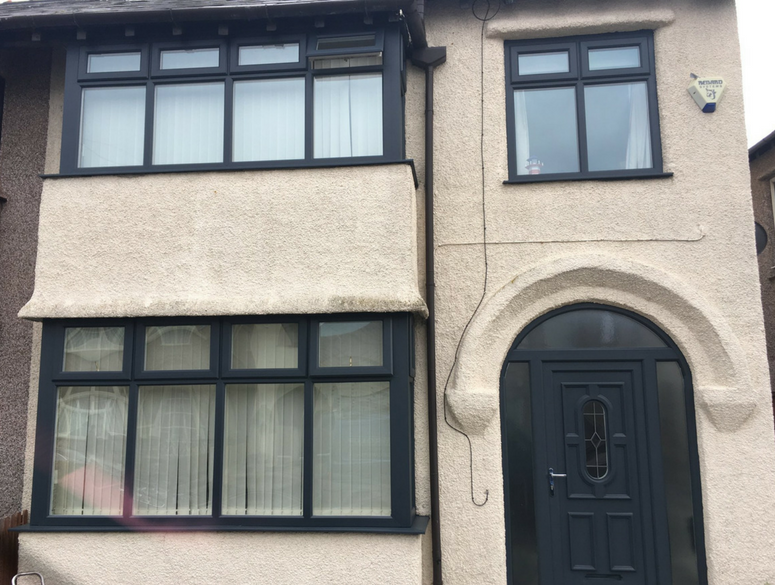 If you’re looking to transform the look of your existing uPVC doors, you’re in capable hands, here at The Restoration Group. We provide spraying and restoration for uPVC windows, doors and conservatories, making the most of the latest uPVC painting technologies. With our help, why not make your domestic or commercial property more eye-catching and presentable? Our uPVC door spraying and restoration services are carried out by our team of experts who have the know-how for what works best. With their expert knowledge, you can rest assured that they will enhance the appearance of your uPVC doors quickly and effectively. You want to be sure that you choose a colour that suits both the interior and the exterior of your property; no matter what colour you choose, you can bet we have it, here at The Restoration Group! Choosing the right colour will set your uPVC door apart from any other- be sure to discuss your requirements in detail with one of our experts today! Updating your home or business doesn’t need to be difficult; we can help you to restore your property, making it more welcoming and stylish. We make sure that spraying and restoring your uPVC doors is affordable, we offer suitability for an array of needs and wants. At The Restoration Group, we provide our services to suit any budget- so you needn’t worry about receiving the best value for money! When you choose to spray your doors, you can bet that they will last, maintaining quality standards for longer. If you’re on a budget, you could benefit from painting your uPVC windows, rather than replacing them with brand new ones. At The Restoration Group, we make sure that your glass windows and other surroundings are protected from the spray, allowing you to create an enhancing first impression for all visitors. If you need to know any more information about our uPVC door painting, feel free to call 01613270482 today!